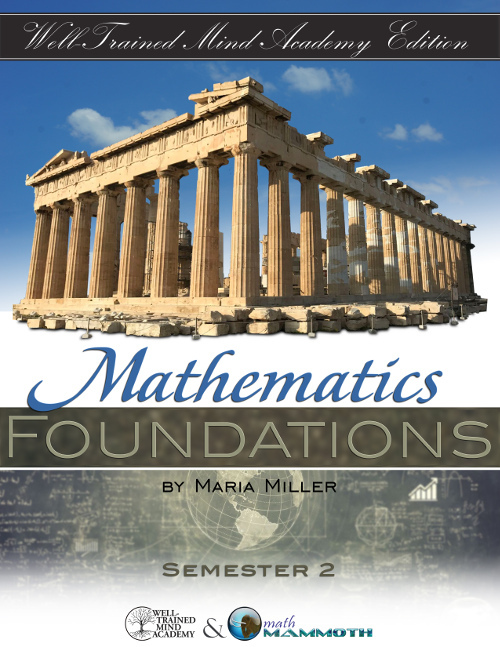 Mathematics Foundations: Well-Trained Mind Academy Edition is a set of two custom-made books for the Mathematics Foundations course offered by the Well-Trained Mind Academy. The books are compiled of lessons and pages taken from grades 1 through 7 of the Math Mammoth Complete Curriculum (Light Blue Series). 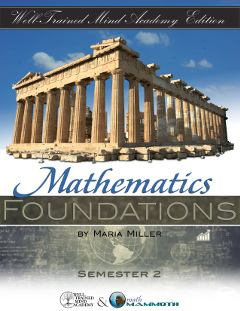 The Mathematics Foundations course is designed for those students who have completed an elementary mathematics program but do not possess strong math skills and who may have have gaps in their math knowledge, preventing success in the traditional curriculum sequence. The course includes a review of basic arithmetic skills, including operations, number theory, decimals, percents, integers, variables, the Cartesian plane, and basic geometry. Emphasis is given to mastering fractions. The material is divided into two books: one for Semester 1, and another for Semester 2.